Where in the park was this located? I believe part of that building is still being used today. It is pretty much right across the street from the tintype shop, and possibly the very same building in this photo here. Somebody else may verify this or set me straight. This is actually next to the railroad crossing, across the road from the current Kettle Corn. Today it is just a room for sweepstakes entries and an Ancestry.com kiosk (last I saw). 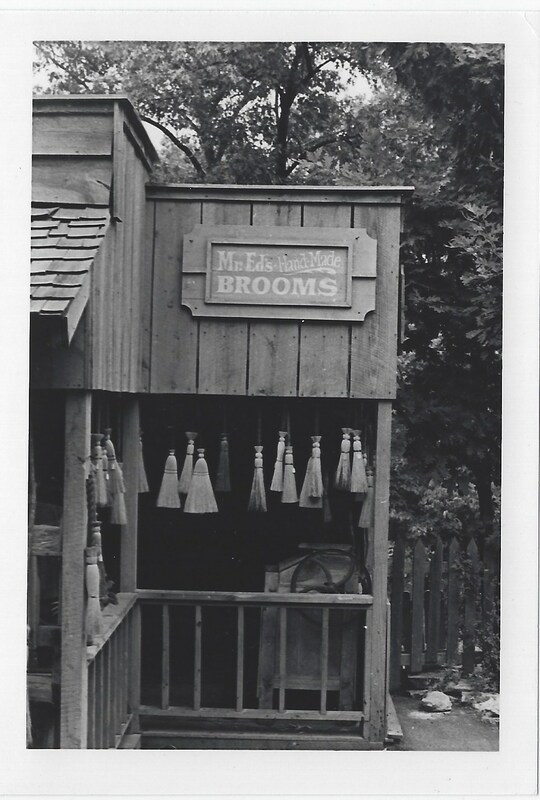 I do remember the broom shop being at that location, but that would have been much later than the mid 1960's picture. At that time there was not even a walkway in the Kettle Corn area. If I remember correctly the first walkway would have been about the same time the Deep Woods area was built. 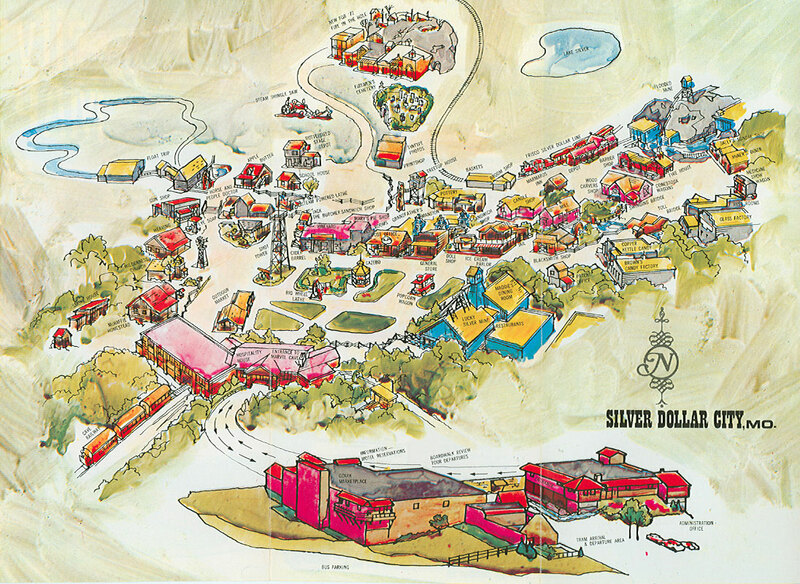 Here is a picture of a map from 1971 of SDC. If you look the train locomotive is parked between the Marmaros Inn and the broom shop. The Marmaros Inn is the same building as Bears At The Holler is today. This was pretty much the map I was using to decide where the Broom Shop was. I still could be wrong because the picture was even earlier than the map. It sure enough looks like that location to me. The fence to the right even fits the railroad crossing location. Are you certain of the date? I am not certain of the exact date, but all of my black & white photos point to a time period in the 60's. 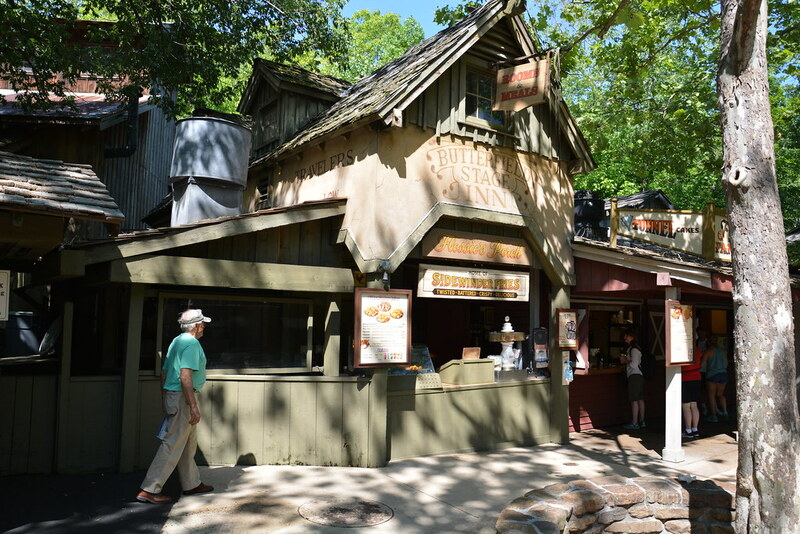 The earliest a walkway through where the Kettle Corn is today would be about 1977. I am pretty sure that is when the Deep Woods opened, which would be the same year the Diving Bell opened in that area. Thats a great pic of the old map.. I believe Pintrader is correct on the location; even the little drawing of the building on the map looks the same. I also noticed that "Fireman's Cemetery" is drawn out and listed on the old map. Now its completed hidden in the shadows and blocked off the majority of the time. Im not even sure if it still on the map..
After looking at the old map again, I wonder how many times the Steam engine Shingle machine has been moved and relocated through the years.. I don't think so. I think Pintrader may have it right. The angle of the porch and corner of the building is off, and the fence isn't right. That would allow people to sneak into the corner right up next to the tracks, though it's possible I guess since there is a little "booth" for the guard/ prisoner to hide in a bit in the case of not so nice weather. But if it was that location, there should be at least a glimpse of the tracks behind it, and I don't see that. It does look more like the building up near the corkscrew hill and it's entrance. Hindsight says, they should have seat aside about 10 acres for a SDC musuem.!! Can you imagine? Next to the Shot Tower is the Outdoor Market, which would be the Taffy Shop today. Can anyone on here describe this in any way? I myself do not remember it, and just wondered if they sold fresh produce or what. Any thoughts on this?